Christmas dinner, for many people, means gathering at home to eat a traditional meal of ham, potatoes and the like. For Jews, Christmas dinner means a night out at the local Chinese restaurant chowing down on beef with broccoli and lo mein noodles. For my Chinese-Jewish family, we’re usually found devouring a bit more authentic Chinese cuisine. A plate of General Tsao’s chicken is not typically found amongst our orders. Last night was no exception. Having spent the whole day cleaning the post-finals mess of the apartment (imagine papers strewn into every nook and corner), I joined Mama and Papa Rose in Flushing for dinner. I was hoping for dim sum, but it was really too late in the day for it and Mama Rose suggested going back to a restaurant they had been taken to by others the previous week, 一家餐廳 (One Family Chinese Restaurant). I never question her Chinese food restaurant choices, she’s usually right on the money. Mama Rose is quite discerning about Chinese food—whether ordering it or making it herself. As a kid I never really realized the good fortune I had with a mom who could make all sorts of food and best of all—different types of Chinese cuisine. I’ve tried very hard in the last few years to make up for it--when I’m home, I ask a lot of questions while she cooks. “How much of X spice do you use for this dish?” “Why would you add those two ingredients together/separate?” “Why do you use X spice instead of Y spice?" It is a similar story with ordering Chinese food. Until I went to China during college, I had never ordered food in a Chinese restaurant and all of a sudden I had to order Chinese food in CHINESE! It was a daunting and frightening task and I wasn’t very good at it in the beginning. I somehow managed for those six months, but I vowed when I returned home to learn the names of dishes (in Chinese and English) my mom ordered and that I loved to eat at Chinese restaurants. With my language skills improving over the years, I’m now able to order more competently in either English or mandarin, but I always desire to expand my cuisine vocabulary. Last night was no exception and I paid close attention when she asked the waitress specific questions about a variety of dishes and then I peppered her with a few of my own food queries. I find that I now scan the menu to find the names of the dishes in Chinese, a way to remember them when I’m ordering by myself or with a group of friends. One Family Restaurant serves a wide variety of food, such as Taiwanese snacks, Chinese breakfast items, and more familiar northern and southern noodle dishes. There are also some dim sum on the menu as well as cold dishes and Chinese casseroles. We started our meal with 海鮮豆腐羹 (Seafood and bean curd soup). 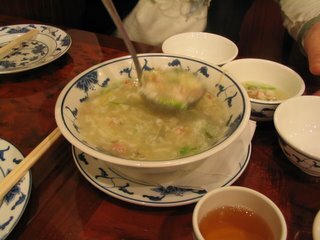 It was thick and gooey, similar in consistency to egg drop soup. The soup was loaded with shrimp, scallops, and fish plus mushrooms, egg whites and sliced green beans. The ingredients were simple and the freshness of the seafood came through in every slurp. I must admit, I’m a big fan of gelatinous soups because I love the way it clings down my throat, warming me from the inside. What I really liked most about this soup is that it wasn’t very salty. Many Chinese restaurants load their soups with salt (or worse, MSG) which forces you to drink an inordinate amount of tea that eventually leads to multiple trips to the restroom. 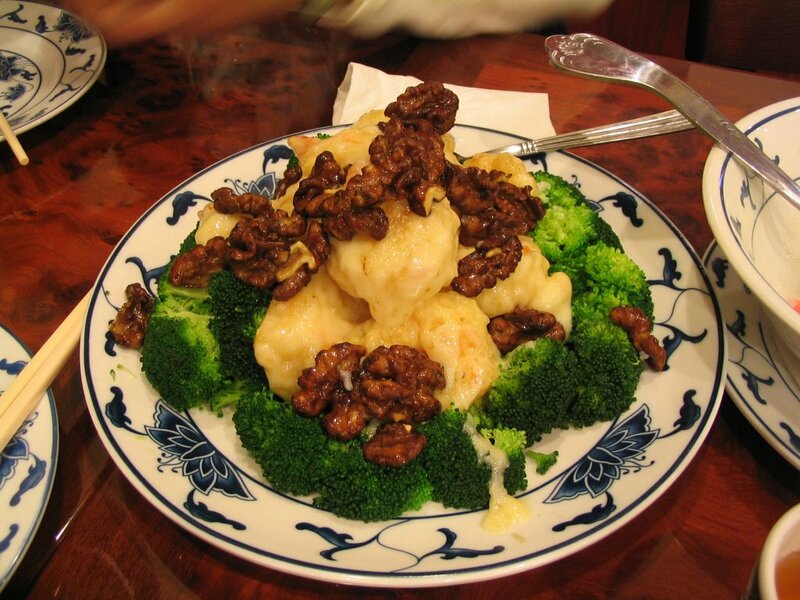 Our next dish was 核桃脆皮大蝦 (Crispy Prawns with Walnuts). When it came out I realized right away that this was most certainly Taiwanese cuisine. The prawns were fried and smothered in sweet Japanese mayonnaise and served on a bed of broccoli. The 50 year colonization of Taiwan by the Japanese in the first half of the 20th century left an indelible mark in Taiwanese culture and society--food is no exception. With the politics of today, Taiwanese often still look to Japan for cultural inspiration and the use of sweet mayonnaise is a product of all these influences. That said, I’m not a fan of the mayonnaise and I find it overpowers what ever else is in the dish. In this case, I spent a couple of minutes trying to slide each shrimp back and forth across my empty plate in order to remove the excess mayonnaise. The lightly caramelized walnuts were a nice crunchy complement to the prawns, but the whole thing was too sweet for what should be a much more savory dish. 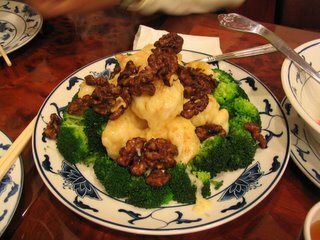 Our second course was 紅燴海參 (Braised Sea Cucumber in Brown Sauce). 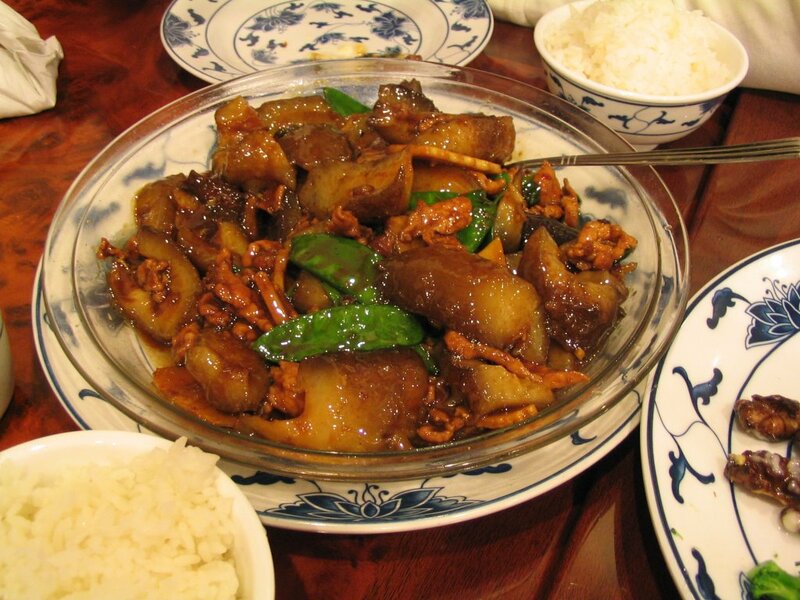 Considered a delicacy in Chinese cuisine, especially due to its medicinal value, sea cucumbers are used with other ingredients to create a glutinous texture to braised dishes. With some shredded beef and snow peas, ours was both light and flavorful. Like the soup, it was not weighed down with salt and the brown sauce covered the ingredients, but did not drench them. It’s a rather expensive dish compared to the rest of One Family’s menu, but if you’re looking to try something new in Chinese cuisine, I’d highly recommend braised sea cucumber. 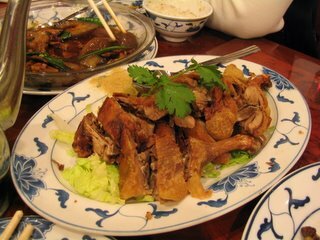 During our ordering, Mama Rose questioned our waitress about a specific roast duck dish she had tried before. Aptly named 香酥鴨 (Fried Crispy Duck), it was just that. The skin was certainly crispy, but I did find the meat a bit too dry. Papa Rose felt it tasted both “ducky” and salty, but I felt it was a pretty good version of a dish that can often be well overcooked. Our final dish was a simple side of snow pea leaves with braised scallops. I’m particularly found of snow pea leaves and have found them a refreshing change from the usual spinach leaves and watercress I often eat during a Chinese meal. 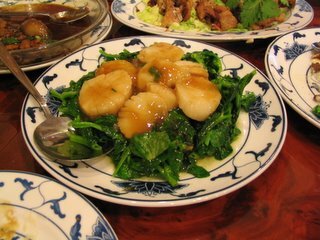 The scallops were very fresh and like the braised sea cucumbers, they were not drenched in brown sauce. The biggest problem with One Family Chinese Restaurant is the noise level. The downstairs section is a rather narrow room with no carpeting and wall to wall mirrors. This makes every whisper into a shout and the upstairs karoke room does not help the matter. Throughout much of our meal I found myself nearly screaming to my mother across the small table. The ambiance aside, the meal was very good and definitely a place I’d go back to with friends. So another Rose Christmas dinner of Chinese food goes down as a keeper. Chinese restaurants in Flushing (and Chinese restaurants outside of whatever you consider China in general) never fail to disappoint me with their half-hearted dishes laden with gunky sweet sauces, their desultory waiters, and their total lack of atmosphere. This one, though, sounds promising enough. Those scallops on pea leaves look yummy. I'll have to try it out when my parents come to town. Mama Rose is just like my mom, she knows what to order. Ordering in a Chinese restaurant IS a daunting task! Especially if you're in America, you have to show your waiter you really KNOW your stuff with the right amount of assertiveness ("don't bring me the stuff you fool Americans with!"). So stressful. Chinese mothers are indispensable for going to Chinese restaurants! Said so well from experience, eh? I'm one of those Americans trying not to be fooled so I'm pleased to read about what more knowledgable diners order. And I must confess that I love the shrimp in mayonnaise you found objectionable. Perhaps this is because I love mayonnaise? Anyhow, the quest for "authentic" cuisine is ultimately futile. After all, the Italians got tomatoes from the new world and didn't much care for them for a few hundred years after trying them out. Now we think of tomatoes as authentically Italian. Mayonnaise, of course, came to Japan from the West. Nice blog you have here. I don't remember how I got here but I'm glad I did. I guess I wouldn't mind the mayonnaise if there wasn't SO MUCH of it on the shrimp. There may not be a true authenticity to any cuisine, but I do think there are degrees of it. Food history is just that, it's history--our cuisines do evolve over time and become influenced by ingredients introduced over periods of time. But by going back to original sources of recipes (either ingredients, technique, etc) it can often help us better understand the cuisine or cookery of a region/ethnic group, etc. A few changes...and more problems.